Now that is, indeed, a good question. And it’s also a good goal to be aiming for, if that’s what you’re looking for. First of all, let me just say, that getting a Pass A is rare. It’s quite difficult and it is rare. I got a Pass B, I was happy with that, but I didn’t put in all the effort I could have into my preparation. So if you’re doing that, then maybe you can get a Pass A. In terms of grading, since there’s a whole range of factors for each assessed element of the course. Now these elements can be things like your assignments, your teaching, your lesson plans, taking on feedback. I should also add that all the key grading criterion is in the CELTA 5 blue book, which is provided to every CELTA candidate at the start of the course. This is also known as a CELTA Candidate Record Book. 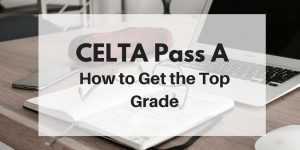 Wanting to Get a CELTA Pass A Grade? Start by sending a request to the marking criteria document from your CELTA center. Now I would suggest specifically for the assignments, as this is something clear and concrete, which you can start working towards and you’ve got a benchmark that is very specific. Now don’t worry if your CELTA center won’t give you this. They might well not, but you can find them online. Now all you need to really do is Google CELTA assignments or CELTA, focus on the learner assignment, something like that, and you will find links to them. There are examples online that give the assessment criteria and some of the schools have even posted them online. The only catch with this, is that every CELTA center has slightly different assignments, so it will be a bit tricky. You’ve got to be aware that these could be different from yours. However, it’s not a huge variation. They’re all looking for similar things like your awareness of language skills and needs and these needs analysis, identification, rationale, suggesting activities. It also requires some referencing, and your use of English language. So these parts are more or less standard in many ways, but the very specifics could be a bit different. Another clear thing you can prepare in the same way is also looking at lesson plans, and hopefully, you can find some of the lesson plans for your center online. Now this is where it’s helpful if you’re enrolled in a school with this course. If you’re doing the course with an international provider, like an International House, or the British Council, you will more likely find some of their lesson plans, either on their website or from past CELTA students who’ve put them up there in the public domain. Therefore you will see all that’s expected of you on the lesson plan. You can now start focusing on the difficult part that worries you a lot. 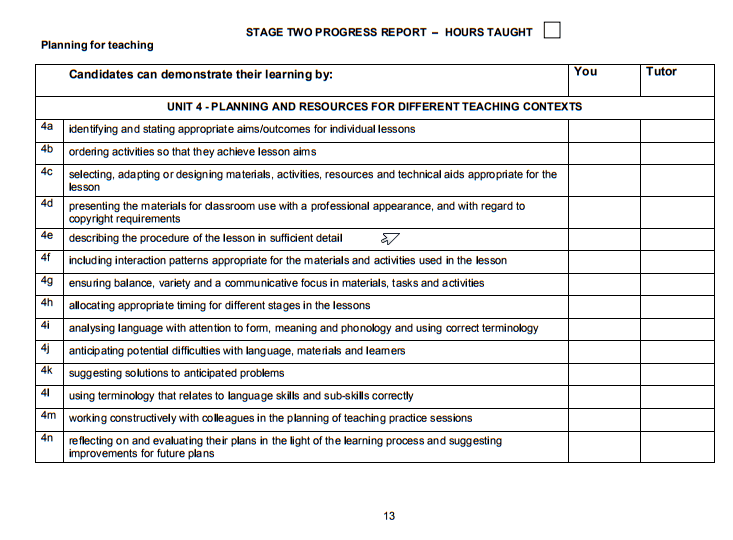 Teaching practice is all about awareness, development, reflection, and acting upon feedback. To make this right, you’ve got to prepare thoroughly and focus on giving the students the best possible experience furthermore make the students understand what this course is all about. Nobody is expecting you to know every aspect of English grammar on a CELTA course, as you are basically doing a crash course in becoming an English teacher. However, having a good background in grammar is clearly an advantage. I’m not saying, “Don’t learn it,” but there’s always a room for improvement of your CELTA course and the grades. So what I would really say is, “Yeah, keep making progress along the way,” because your teacher’s going to give you a lot of dense and very rich feedback. Development is what the teachers would really like to see. Taking this feedback is showing them you are aware, assessing, and critically analyzing your finest approach. This will hopefully gives you a powerful momentum towards getting the top grade. Exactly How to Get a Pass A Grade in CELTA? Focus on the clear logistical aspects and on the bits that worry or scare you before you start and you will be fine! For other questions, you can go to celtahelper.com/ask and record your voice question there. It’s totally free as a voice mail. or perhaps just leave a comment there and ask away. You can also ask me by email at stephen@celtahelper.com. So thanks you so much for listening. I hope this was useful and I’ll talk to you soon!